Hi, Good Morning. Thank You, Friends and viewers. 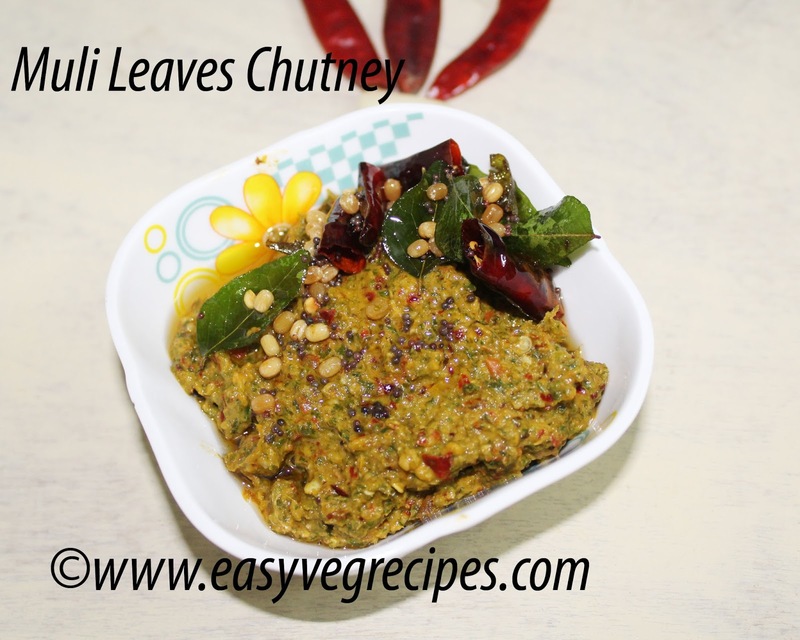 Today I will post how to make mullangi leaves(radish greens) Chutney recipe. Mullangi, muli or White radish have a strong flavour. It is an edible root vegetable and mostly eaten raw. Whenever I bought them without leaves. But wonder when some people pick the leaves and some times people ask only for them. When enquired about how to cook them, came to learn that they are used in different recipes like chutney, dal and curry. Dal and curry are made with moong dal and chutney we can make it like any other chutney. Added one tomato and some green chhilies to reduce the pungent smell. Made very less quantity chutney to taste it, liked the taste. 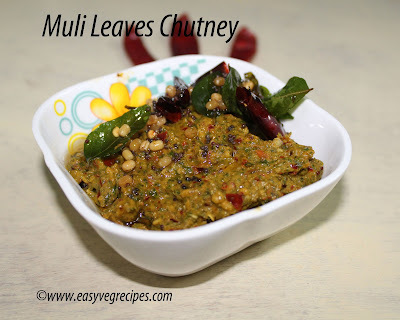 Chop mullangi leaves, cut tomatoes and split green chillies. Wash them thorougly and keep aside. Heat oil in a pan, add half portion of mustard seeds, black gram and fenugreek seeds. When they start spluttering add asafoetida. Add green chillies, red chillies to them and fry. Add tomatoes and chopped muli leaves, garlic and cook them till the raw smell goes off. Or the tomatoes turn mushy. Once done keep it aside and allow this to coool. Meanwhile again heat the pan and prepare tadka. Add remaining mustard seeds, black gram, fenugreek seeds, one red chilli and curry leaves. When they start spluttering switch off the flame and keep it aside. This is a very common tadka for every chutney. By now the above muli leaves and tomato mixture might have cooled. Add them to the blender jar, add salt, turmeric powder and tamarind. Grind it to make chutney, add water if necessary. But the chutney should be coarsely grounded. We can make this chutney in stone mortar and pestle.